Ahhh Spring… Finally. I am so ready for all the wonderful fruits that it brings such as strawberries and berries and melon…As far as desserts, I am more of a chocolate fan, but I love fruits too! 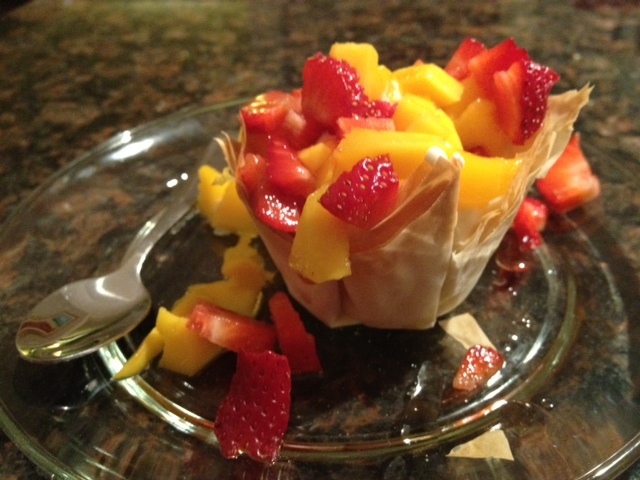 My favorite desserts with fruits are those where the fruits are served as they are, uncooked and au naturel. I love fruit tarts, vacherin ( icecream and meringue cake on top of which fruits are added), pavlovas. The problem with some of those desserts is the time that it takes to make them. When I have time, I love to make them but since I am often limited with times, I have to find desserts that are fast, look great and that taste yummy. There is so much you can do with mousse and fresh fruits but I was thinking of something for my cooking class that would be very easy and that would not involve too much time. Fillo dough is that magical medium that allows you to do all that. It is so light that it takes no time to cook. It is so easy to mold into what you want your desserts to look like that using something else. Finally it is so light and airy that it almost becomes transparent and let the fruits shine since it is not empowering the dessert. 2 mangos peeled and diced thinly. Use only one package of the fillo dough and place the rest back into your freezer. 1. Take the fillo dough out to thaw it out. 2. With some scissors, cut squares of about 2 1/2 inches. 3. 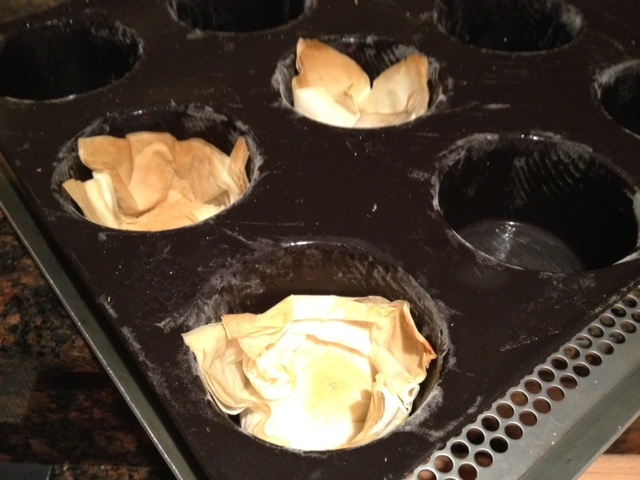 Take 3-4 sheets and layer them inside each cupcake hole. 4. With a pastry brush, brush some melted butter or olive oil on the sides of each of those cups, or use a oil spray and spray the cups. 5. 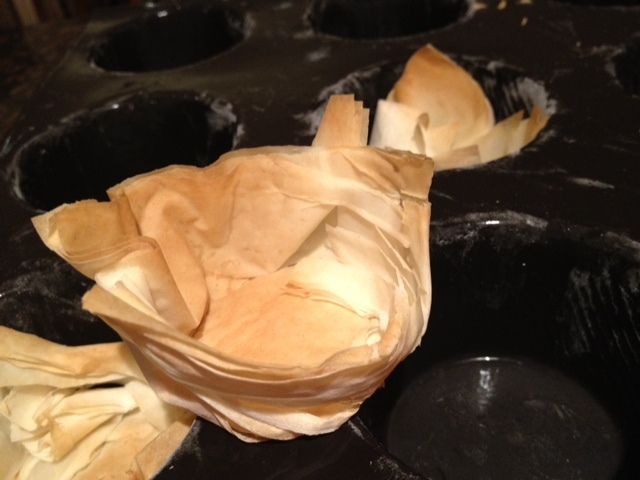 And bake those cups at 375 for 5-8 minutes or until they become golden brown. 6. Meanwhile place the heavy cream in a large bowl and with a whisk, beat the cream until it starts forming soft peaks. 7. Add the mascarpone and beat well. 8. Add 2-3 tbsp of maple syrup and beat well again. 9. Spoon the cream mixture into each cup. 10. In a large bowl, mix the diced strawberries and the diced mangos. Spoon the fruit salad over the cream and drizzle more maple syrup over the cups and fruit. Devour!!!! 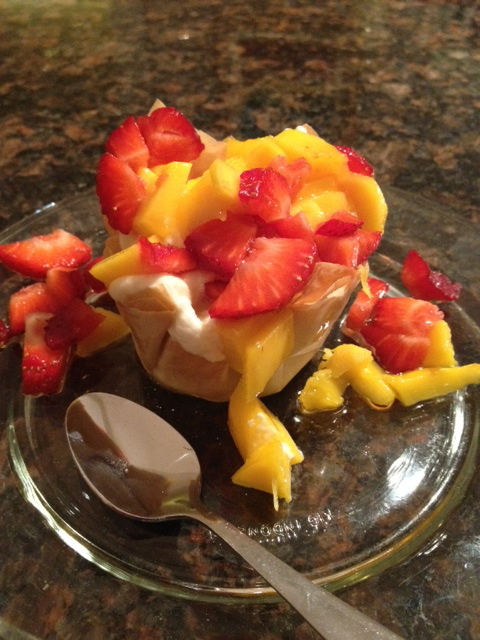 Delicious sounding dessert…perfect for spring. Great photo by the way.